Moscow (Russian: Москва́, romanized: Moskva, IPA:) is the capital of Russia and the country's economic, financial, educational, and transportation center. It is located on the Moskva River in the Central Federal District, in the European part of Russia. The most populous city in Europe, metropolitan Moscow has a population of close to 12 million, which constitutes about 7 percent of the total Russian population. Historically, it was the capital of the former Soviet Union and the Grand Duchy of Moscow, the pre-Imperial Russian state. It is the site of the Kremlin, which now serves as the ceremonial residence of the President of Russia. Moscow is world-renowned for its architecture and its performing arts. It is well-known for the elegant onion domes of Saint Basil's Cathedral, as well as the Cathedral of Christ the Savior and the Seven Sisters. The Patriarch of Moscow, whose residence is the Danilov Monastery, serves as the head of the Russian Orthodox Church. Moscow also remains a major economic center and is home to a large number of billionaires. It is home to many scientific and educational institutions, as well as numerous sports facilities. It possesses a complex transport system that includes the world's busiest metro system, which is famous for its architecture. Moscow also hosted the 1980 Summer Olympics. The city is named after the river (ancient Russian: гра́д Моско́в, literally the city by the Moskva River). The name of the city is usually pronounced [ˈmɒskəʊ] in British English, and either [ˈmɑskaʊ] or [ˈmɑskoʊ] in American English. The origin of the name is unknown, although several theories exist. The most reliable theory is that the name derives from Finno-Ugric Moska tribe who lived along the Moskva river. 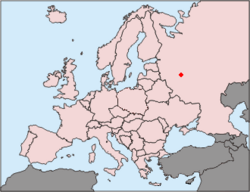 Their main settlement was named Moskova which suggest some connections to Karelia and Tshuudis. One theory suggests that the source of the name is an ancient Finnic language, in which it means "dark" and "turbid." Alternatively, the name may come from the Finno-Permic Komi language, meaning "cow-river" or from the Finno-Volgaic Mordovian language, meaning "bear-river". In Tatar-Turkic languages this wooden Finno-Ugrian settlement was also called Moskova. The oldest evidence of humans in the area where Moscow now stands dates from the Stone Age (Schukinskaya Neolithic site on the Moscow River). Within the modern bounds of the city, a burial ground of the Fatyanovskaya culture has been discovered, as well as evidence of early-Iron Age settlements of the Dyakovskaya culture, on the grounds of Kremlin, Sparrow Hills, Setun River, and Kuntsevskiy forest park. At the end of the first millennium C.E., the territory of Moscow and the Moscow Oblast was inhabited by the Slavic tribes of Vyatichi and Krivichi. By the end of the eleventh century, Moscow was a small town with a feudal center and trade suburb situated at the mouth of the Neglinnaya River. The first written reference to “Moscow” dates from 1147, when it was an obscure town in a small province inhabited mostly by Merya, speakers of a now extinct Finnic language. Yuri Dolgoruki called upon the prince of the Novgorod Republic to "come to me, brother, to Moscow." In 1156, Prince (Knjaz) Yury Dolgoruky of Kiev ordered the construction of a moat and a wooden wall, which had to be rebuilt multiple times, to surround the emerging city. After the sacking of 1237-1238, when the Mongol Khanate of the Golden Horde burned the city to the ground and killed its inhabitants, Moscow recovered and became the capital of an independent principality in 1327. 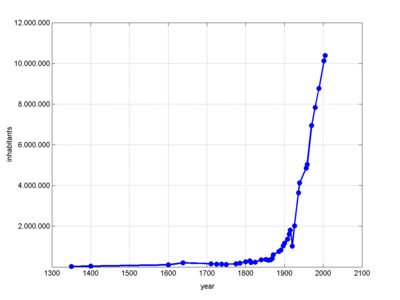 Its favorable position on the headwaters of the Volga River contributed to steady expansion. Moscow developed into a stable and prosperous principality which attracted a large number of refugees from across Russia. Under Ivan I the city replaced Tver as capital of Vladimir-Suzdal and became the sole collector of taxes for the Mongol-Tatar rulers. By paying a large amount of tribute, Ivan won an important concession from the Khan. Unlike other principalities, Moscow was not divided among his sons but was passed intact to his eldest. In 1380, prince Dmitri Donskoi of Moscow led a united Russian army to an important victory over the Tatars in the Battle of Kulikovo. Although this victory is regarded as historically important, it was not decisive. After two years of battle, Moscow was completely destroyed by khan Tokhtamysh. In 1480, Ivan III had finally broken the Russians free from Tatar control, allowing Moscow to become the center of power in Russia. Ivan III relocated the Russian capital to Moscow (previous capitals were Kiev and Vladimir), and the city became the capital of an empire that would eventually encompass all of present-day Russia and other lands. In 1571 the Tatars from the Crimean Khanate seized and burned Moscow. From 1610 through 1612, troops of the Polish-Lithuanian Commonwealth occupied Moscow, as its ruler Sigismund III tried to take the Russian throne. In 1609 the Swedish-Finnish army, led by Count Jacobus (Jaakko) De la Gardie ("Lazy Jaakko") and Evert (Eetvartti) Horn started its march from Velikiy Novgorod toward Moscow to help Tsar Vasili Shuiski crush an internal uprising. They entered Moscow in 1610 and suppressed the rebellion against Tsar, but after they left early in 1611, the Polish-Lithuanian army invaded. In 1611 Moscow suffered a great fire. In 1612, the people of Nizhny Novgorod and other Russian cities conducted by prince Dmitry Pozharsky and Kuzma Minin rose against the Polish occupants,besieged the Kremlin and expelled them. In 1613, the Zemsky sobor elected Michael Romanov tsar, establishing the Romanov dynasty. The seventeenth century was rich in popular risings, such as the liberation of Moscow from the Polish-Lithuanian invaders (1612), the Salt Riot (1648), the Copper Riot (1662), and the Moscow Uprising of 1682. The city ceased to be Russia's capital in 1712, after the founding of Saint Petersburg by Peter the Great on the Baltic coast in 1703. When Napoleon invaded Russia in 1812, the Muscovites burned the city and evacuated, as Napoleon's forces were approaching on September 14. Napoleon's army, however, plagued by hunger, cold, and poor supply lines, was forced to retreat and was almost destroyed by Russian military forces. In January 1905, the institution of the City Governor, or Mayor, was officially introduced in Moscow, and Alexander Adrianov became Moscow's first official mayor. Following the success of the Russian Revolution of 1917, on March 12, 1918, Moscow became the capital of the Russian Soviet Federative Socialist Republic and the Soviet Union less than five years later. During the Great Patriotic War (the part of World War II after German invasion in the USSR) in 1941, the Soviet State Committee of Defense and the General Staff of the Red Army was located in Moscow. In 1941, 16 divisions of the national volunteers (more than 160,000 people), 25 battalions (18,500 soldiers) and four engineering regiments were formed among the Muscovites. In November 1941, German Army Group Center was stopped at the outskirts of the city and then driven off in the course of the Battle of Moscow. Many factories were evacuated, together with much of the government, and from October 20 the city was declared to be under siege. Its remaining inhabitants built and manned antitank defenses, while the city was bombarded from the air. It is of some note that Stalin refused to leave the city, meaning the general staff and the council of people's commissars remained in the city as well. Despite the siege and the bombings, the construction of Moscow's metro system, which began in the early 1930s, continued through the war and by the end of the war several new metro lines were opened. On May 1, 1944 a medal For the defense of Moscow and in 1947 another medal In memory of the 800th anniversary of Moscow were instituted. On May 8, 1965 in commemoration of the twentieth anniversary of the victory in World War II, Moscow was one of 12 Soviet cities awarded the title of Hero City. In 1980, it hosted the Summer Olympic Games. In 1991 Moscow was the scene of a coup attempt by the government members opposed to the reforms of Mikhail Gorbachev. When the USSR was dissolved in the same year, Moscow continued to be the capital of Russia. Since then, the emergence of a market economy in Moscow has produced an explosion of Western-style retailing, services, architecture, and lifestyles. Moskva riverside in the nineteenth century. As with most medieval settlements, early Moscow required fortresses to defend it from invaders such as the Mongols. In 1156, the city's first fortress was built (its foundations were rediscovered in 1960). A trading settlement, or posad, grew up to the east of the Kremlin, in the area known as Zaradye (Зарядье). In the time of Ivan III, the Red Square, originally named the Hollow Field (Полое поле) appeared. In the sixteenth and seventeenth centuries, the three circular defenses were built: Kitay-gorod (Китай-город), the White City (Белый город) and the Earthen City (Земляной город). However, in 1547, two fires destroyed much of the town, and in 1571 the Crimean Tatars captured Moscow, burning everything except the Kremlin. The annals record that only 30,000 of 200,000 inhabitants survived. The Crimean Tatars attacked again in 1591, but this time were held back by new defense walls, built between 1584 and 1591 by a craftsman named Fyodor Kon'. In 1592, an outer earth rampart with 50 towers was erected around the city, including an area on the right bank of the Moscow River. As an outermost line of defense, a chain of strongly fortified monasteries was established beyond the ramparts to the south and east, principally the Novodevichy Convent and Donskoy, Danilov, Simonov, Novospasskiy, and Andronikov monasteries, most of which now house museums. By 1700, the building of cobbled roads had begun. In November of 1730, the permanent street light was introduced, and by 1867 many streets had a gaslight. In 1883, near the Prechistinskiye Gates, arc lamps were installed. In 1741 Moscow was surrounded by a barricade 25 miles long, the Kamer-Kollezhskiy barrier, with sixteen gates at which customs tolls were collected. Its line is traced today by a number of streets called val (“ramparts”). Between 1781 – 1804 the Mytischinskiy water-pipe (the first in Russia) was built. 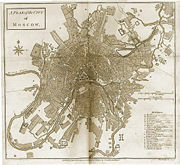 In 1813 a Commission for the Construction of the City of Moscow was established. It launched a great program of rebuilding, including a partial replanning of the city-center. Among many buildings constructed or reconstructed at this time were the Grand Kremlin Palace and the Kremlin Armoury, the Moscow University, the Moscow Manege (Riding School), and the Bolshoi Theatre. In 1903 the Moskvoretskaya water-supply had appeared. The postwar years saw a serious housing crisis, which stimulated the invention of commieblocks; apartments were built and partly furnished in the factory before being raised and stacked into tall columns. There are about 13,000 of these standardized, prefabricated apartment blocks. The popular Soviet-era comic film Irony of Fate parodies this soulless construction method. A groom on his way home from his bachelor party passes out at an airport and wakes up in Leningrad, mistakenly sent there by his friend. He gets a taxi to his address, which also exists in Leningrad, and uses his key to open the door. All the furniture and possessions are so standardized that he doesn't realize that this isn't his home, until the real owner returns. The film struck such a chord with Russians, watching on their standard TVs in their standard apartments, that the film is now shown every New Year's Eve. The population of Moscow is rapidly increasing. The ubiquitous presence of legal and illegal permanent and temporary migrants, plus merging suburbs, raises the total population to about 13.5 million people. According to the 2005 Russian Census the population of the city proper was 10,407,000; however, this figure only takes into account legal residents, and not the several million estimated illegal immigrants and gastarbeiters living in the city. Moscow is home to an estimated 1.5 million Muslims, including about 100,000 Chechens, and between 50,000 and 150,000 Chinese. Due to a low birth rate and high mortality rate, the population of Russia has been declining by about 700,000 persons per year since the fall of the Soviet Union. While the birth rate has risen in more recent years, the average age of Moscow's population continues to increase. In 2004 there were more than twice as many people over the age of 55 as there were under the age of 14. Substantial numbers of internal migrants mean that Moscow's population is still increasing, whereas the population of many other Russian cities is in decline. Migrants are attracted by Moscow's strong economy which contrasts sharply with the stagnation in many other parts of Russia. In order to help regulate population growth, Moscow has an internal passport system that prohibits non-residents from staying in the capital for more than 90 days without registration. Mayor's office (former Comecon headquarters) highrise to the left and Russian government to the right, view from Kudrinskaya square Stalin skyscraper. Moscow is the seat of power for the Russian Federation. At the center of the city, in Central Administrative Okrug, is the Moscow Kremlin, which houses the home of the President of Russia as well as many of the facilities for the national government. This includes numerous military headquarters and the headquarters of the Moscow Military District. Moscow, like with any national capital, also hosts all the foreign embassies and diplomats representing a multitude of nations in Russia. Along with Saint Petersburg, Moscow is designated as one of only two federal cities within Russia. Moscow is located within the central economic region, one of twelve regions within Russia with similar economic goals. The entire city of Moscow is headed by one mayor. 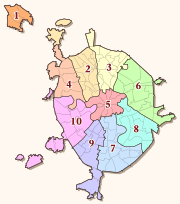 It is divided into ten administrative okrugs and 123 districts. Nine of the ten administrative districts, except the City of Zelenograd (number 1 on the map), are located within City of Moscow main boundaries. All administrative okrugs and districts have their own coats of arms, flags, and elected head officials. Additionally, most districts have their own cable television, computer network, and official newspaper. In addition to the districts, there are Territorial Units with Special Status, or territories. These usually include areas with small or no permanent populations, such as the case with the All-Russia Exhibition Center, the Botanical Garden, large parks, and industrial zones. In recent years, some territories have been merged with different districts. There are no regions of specific ethnicity in Moscow. And although districts are not designated by income, as with most cities, those areas that are closer to the city center, metro stations or green zones are considered more prestigious. Moscow is the administrative center of Moscow Oblast, but as a federal city, it is administratively separate from the oblast. Moscow is exposed to cold winters, warm and mild summers, and very brief spring and autumn seasons. Typical high temperatures in the warm months of July and August are around 22°C (72°F); in the winter, temperatures normally drop to approximately -12°C (10°F). The highest temperature ever recorded was 36.7 ℃ (98.1 ℉). and the lowest ever recorded, -42.2°C in January 1940. Monthly rainfall totals vary minimally throughout the year, although the precipitation levels tend to be higher during the summer than during the winter. Due to the significant variation in temperature between the winter and summer months as well as the limited fluctuation in precipitation levels during the summer, Moscow is considered to be within a continental climate zone. Moscow is situated on the banks of the Moskva River, which flows for just over five hundred kilometers through western Russia, in the center of the East-European plain. There are 49 bridges across Moskva River and its canals within city limits. Moscow's road system is centered roughly around the heart of the city, the Moscow Kremlin. From there, the roads in general radiate out to intersect with a sequence of circular roads or "rings" focused at the Kremlin. The first and innermost major ring, Bulvarnoye Koltso (Boulevard Ring), was built at the former location of the sixteenth century city wall around what used to be called Bely Gorod (White Town). The Bulvarnoye Koltso is technically not a ring; it does not form a complete circle, but instead a horseshoe-like arc that goes from the Cathedral of Christ the Saviour to the Yauza River. In addition, the Boulevard Ring changes street names numerous times throughout its journey across the city. The second primary ring, located outside the Boulevard Ring, is the Sadovoye Koltso (Garden Ring). Like the Boulevard Ring, the Garden Ring follows the path of a sixteenth-century wall that used to encompass part of the city. The third ring, the Third Transport Ring, was completed in 2003 as a high-speed freeway. The Fourth Transport Ring, another freeway, is currently under construction to further reduce traffic congestion. The outermost ring within Moscow is the Moscow Automobile Ring Road (often called the MKAD from the Russian Московская Кольцевая Автомобильная Дорога), which forms the approximate boundary of the city. Outside the city, some of the roads encompassing the city continue to follow this circular pattern seen inside city limits. For a long time the skyline of Moscow was dominated by numerous Orthodox churches. The look of the city changed drastically during Soviet times, mostly due to Joseph Stalin, who oversaw a large-scale effort to modernize the city. He introduced broad avenues and roadways, some of them over ten lanes wide, but he also destroyed a great number of historically significant architectural works. The Sukharev Tower, as well as numerous mansions and stores lining the major streets, and various works of religious architecture, such as the Kazan Cathedral and the Cathedral of Christ the Saviour, were all destroyed during Stalin's rule. During the 1990s, however, both the latter were rebuilt. Architect Vladimir Shukhov was responsible for building several of Moscow's landmarks during early Soviet Russia. The Shukhov Tower, just one of many hyperboloid towers designed by Shukhov, was built between 1919 and 1922 as a transmission tower for a Russian broadcasting company. Shukhov also left a lasting legacy to the Constructivist architecture of early Soviet Russia. He designed spacious elongated shop galleries, most notably the Upper Trade Rows (GUM) on Red Square, bridged with innovative metal-and-glass vaults. Stalin, however, is also credited with building the The Seven Sisters, comprising seven, cathedral-like structures. A defining feature of Moscow's skyline, their imposing form was allegedly inspired by the Manhattan Municipal Building in New York City, and their style—with intricate exteriors and a large central spire—has been described as Stalinist Gothic architecture. All seven towers can be seen from most elevations in the city; they are among the tallest constructions in central Moscow apart from the Ostankino Tower, which, when it was completed in 1967, was the tallest free-standing land structure in the world and today remains the world's second-tallest. The Soviet policy of providing mandatory housing for every citizen and his or her family, and the rapid growth of the Muscovite population in Soviet times, also led to the construction of large, monotonous housing blocks, which can often be differentiated by age, sturdiness of construction, or 'style' according to the neighborhood and the materials used. Most of these date from the post-Stalin era and the styles are often named after the leader then in power: Brezhnev, Khrushchev, etc. They are usually ill-maintained. The Stalinist-era constructions, mostly in the central city, are massive and usually ornamented with Socialist realism motifs that imitate classical themes. However, small churches, almost always Eastern Orthodox, that provide glimpses of the city's past, still dot various parts of the city. The Old Arbat, a popular tourist street that was once the heart of a bohemian area, preserves most of its buildings from prior to the twentieth century. Many buildings found off the main streets of the inner city (behind the Stalinist facades of Tverskaya Street, for example) are also examples of the bourgeois decadence of Tsarist Russia. Ostankino, Kuskovo, Uzkoye and other large estates just outside Moscow originally belonged to nobles from the Tsarist era, and some convents and monasteries, both inside and outside the city, are open to Muscovites and tourists. Attempts are being made to restore many of the city's best-kept examples of pre-Soviet architecture. These revamped structures are easily spotted by their bright new colors and spotless facades. There are a few examples of notable, early Soviet avant-garde work too, such as the house of the architect Konstantin Melnikov in the Arbat area. Later examples of interesting Soviet architecture are usually marked by their impressive size and the semi-Modernist styles employed, such as with the Novy Arbat project, familiarly known as "false teeth of Moscow" and notorious for its wide-scale disruption of a historic area in the heart of downtown Moscow. As in London, but on a broader scale, plaques on house exteriors inform passers-by that a well-known personality once lived there. Frequently the plaques are dedicated to Soviet celebrities not well-known outside of Russia. There are also many 'house-museums' of famous Russian writers, composers, and artists in the city, including Mikhail Lermontov, Anton Chekhov, Dostoevsky, Tolstoy and Pushkin. Moscow's museums and galleries with their collections, are some of the largest and most important in the world. Frequent art exhibitions of both new and classic painting, photography, and sculpture thrive, as they once did in pre-Revolutionary times. One of the most notable art museums in Moscow is the Tretyakov Gallery, which was founded by Pavel Tretyakov (1832 – 1898), a wealthy patron of the arts who donated a large private collection to the city. 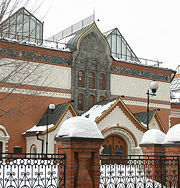 Currently the Tretyakov Gallery is split into two buildings. The Old Tretyakov, the original gallery in the Tretyakovskaya area on the south bank of the Moskva River, houses the works of the classic Russian tradition. The works of famous pre-Revolutionary painters, such as Ilya Repin, as well as the works of early Russian icon painters can be found in the Old Tretyakov Gallery. Visitors can even see rare originals by early-fifteenth century iconographer Andrei Rublev. The New Tretyakov, created in Soviet times, mainly contains the works of Soviet artists, as well as of a few contemporary artists, but there is some overlap with the Old Tretyakov Gallery for early twentieth-century art. The new gallery includes a small reconstruction of Vladimir Tatlin's famous Monument to the Third International and a mixture of other avant-garde works by artists like Kazimir Malevich and Wassily Kandinsky. Works of Socialist realism can also be found within the halls of the New Tretyakov Gallery. Another art museum in the city of Moscow is the Pushkin Museum of Fine Arts. The Pushkin Museum is similar to the British Museum in London in that its halls are a cross-section of world civilizations, with many plaster cast reproductions of ancient sculptures. However, it also hosts famous paintings from every major Western era of art, including works by Claude Monet, Paul Cézanne, and Pablo Picasso. The State Historical Museum of Russia (Государственный Исторический музей) is a museum of Russian history wedged between Red Square and Manege Square in Moscow. Its exhibitions range from relics of the prehistoric tribes inhabiting present-day Russia, through priceless artworks acquired by members of the Romanov dynasty. The total number of objects in the museum's collection numbers in the millions. The Polytechnical Museum, founded in 1872 is the largest technical museum in Russia, offering a wide array of historical inventions and technological achievements, including humanoid automata of the eighteenth century, and the first Soviet computers. Its collection contains more than 160,000 items. The Borodino Panorama museum located on Kutuzov Avenue provides an opportunity for visitors to experience being on a battlefield with a 360° diorama. It is a part of the large historical memorial commemorating the victory in the Patriotic War of 1812 over Napoleon's army, that includes also the Triumphal arch erected in 1827. There is also a military history museum which includes statues and military hardware, accompanied by powerful tales of that time. Moscow is also the center for Russian performing arts, including ballet and film. There are 93 theaters, 132 cinemas and 24 concert-halls in Moscow. Among Moscow's many theaters and ballet studios are the Bolshoi Theater and the Malyi Theater, as well as Vakhtangov Theater and Moscow Art Theater. The repertories in a typical Moscow season are exhaustive, and modern interpretations of classic works, whether operatic or theatrical, are common. Moscow International Performance Arts Center, opened in 2003, also known as Moscow International House of Music, is known for its performances in classical music. It also has the largest organ in Russia, installed in Svetlanov hall. Soviet films are integral to film history and the Mosfilm studio produced many Soviet classic films; it is responsible for both artistic and mainstream productions. However, despite the continued presence and reputation of internationally-renowned Russian filmmakers, the once-prolific native studios are much quieter. Rare and historical films may be seen in Salut cinema where films from the Museum of Cinema collection are shown regularly. There are 96 parks and 18 gardens in Moscow, including four botanical gardens. There are also 450 square kilometers (174 sq mi) of green zones besides 100 square kilometers (39 sq mi) of forests. Moscow is a very green city if compared to other cities of comparable size in Western Europe and America. There is an average of 27 square meters (290 sq ft) of parks per person in Moscow compared with six in Paris, 7.5 in London and 8.6 in New York. The Central Park of Culture and Rest named after Maxim Gorky was founded in 1928. The main part, with an area of 689,000 square meters (170 acres) along the Moskva river contains estrades, children’s attractions, including the Observation Wheel water ponds with boats and water bicycles, dancing, tennis courts and other sport facilities. It borders the Neskuchniy Garden with an area of 408,000 square meters (101 acres), the oldest park in Moscow and a former Emperor's residence, created by integrating three eighteenth-century estates. It contains the Green Theater, one of the largest open amphitheaters in Europe, able to hold up to fifteen thousand people. Izmaylovskiy Park, created in 1931, with an area of 15.34 square kilometers (5.92 sq mi) is six times greater than that of Central Park in New York. and one of the largest urban parks in the world. Sokolniki Park, which got its name from the falcon hunting that occurred here in the past, is one of the oldest in Moscow and has an area of 6 square kilometers (2 sq mi). From a central circle with a large fountain radiate birch, maple and elm tree alleys. Farther, after the deer ponds, there is a labyrinth, composed of green paths. Losiny Ostrov National Park (literally - "Elk Island"), bordering the Sokolniki park, with total area of more than 116 square kilometers (45 sq mi) is the first national park of Russia, located in Moscow and Moscow Oblast. It is thought to be the largest forest in a city of comparable size. It is also known as the "city taiga," where elk can be seen. Tsytsin Main Botanical Garden of Academy of Sciences, founded in 1945 is the largest in Europe. It covers a territory of 3.61 square kilometers (1.39 sq mi) bordering the All-Russian Exhibition Center and contains a live exhibition of more than twenty thousand different species of plants from different parts of the world, as well as a scientific research laboratory. It also contains a rosarium with twenty thousand rose bushes, dendrarium, an oak forest with the average age of trees exceeding 100 years, and a greenhouse on more than 5000 square meters. Lilac park founded in 1958 is known for its permanent sculpture exposition and a large rosarium. Moscow has always been a popular destination for tourists. Some of the better known attractions include the city's UNESCO World Heritage Site, Moscow Kremlin and Red Square, which was built between the fourteenth and seventeenth centuries. Kolomenskoye is another popular attraction with its UNESCO World Heritage Site, the Church of the Ascension, which dates from 1532. Other popular attractions include the Moscow Zoo, home to nearly a thousand species and more than 6500 specimens. Each year, the zoo attracts more than 1.2 million visitors. During the summer, the extended hours of daylight allow more time to visit the wealth of historical, cultural and popular sites in Moscow. Moscow possesses a large number of sport facilities, and over five hundred Olympic champions lived in the city by 2005. Moscow is home to 63 stadiums (besides eight football and eleven light athletics maneges), of which Luzhniki Stadium is the largest, and the fourth largest in Europe. Forty other sport complexes are located within the city, including 24 with artificial ice. There are also seven horse racing tracks in Moscow, of which Central Moscow Hippodrome, founded in 1834, is the largest. Moscow was the host city of the 1980 Summer Olympics, although the yachting events were held at Tallinn, in present-day Estonia. Large athletic facilities and the main international airport, Sheremetyevo Terminal 2, were built in preparation for the 1980 Summer Olympics. Football (soccer) is probably the most popular spectator sport among the young, followed by ice hockey. Clubs such as Dynamo, CSKA, Lokomotiv and Spartak are prominent on the European stage and the members of Russian Premier League. Because of Moscow's cold locale, winter sports have a large following as well. Many of Moscow's large parks offer marked trails for skiers and frozen ponds and canals for skaters. 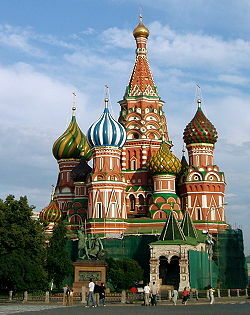 Moscow also hosts the annual Kremlin Cup, a popular tennis tournament on both the WTA and ATP tours. It is regarded as a very prestigious tournament and is one of the ten Tier-I events on the women's tour; every year it features a host of Russian players. Moscow has a vibrant night life. One of the most popular nightlife areas is around Tverskaya Street. The southern part of Tverskaya Street near the Manege Square and the Red Square area is known for its many expensive, luxurious bars and restaurants, and is considered to be a playground for New Russians and celebrities. Tverskaya Street is also one of the busiest shopping streets in Moscow. The adjoining Tretyakovsky Proyezd, also south of Tverskaya Street, in Kitai-gorod, is host to upscale boutique stores such as Bulgari, Tiffany & Co., Armani, Prada and Bentley.Many famous night clubs and casinos, such as Metelitsa are located along Noviy Arbat street. There are 1,696 high schools in Moscow, as well as 91 colleges. Besides these, 222 institutions offer higher education in Moscow, including 60 state universities and the Lomonosov Moscow State University, which was founded in 1755. The university main building located in Vorobyovy Gory (Sparrow Hills) is 240 meters (787 ft) tall and when completed, was the tallest building outside the United States. The university has over 30,000 undergraduate and 7,000 postgraduate students, who have a choice of 29 faculties and 450 departments of study. Additionally, approximately 10,000 high school students take courses at the university, while over two thousand researchers work. The Moscow State University library contains over nine million books, making it one of the largest libraries in all of Russia. Its acclaim throughout the international academic community has meant that over 11,000 international students have graduated from the university, with many coming to Moscow to learn the Russian language. Bauman Moscow State Technical University, founded in 1830, is located in the center of Moscow and provides more than 18,000 undergraduate and 1000 postgraduate students with an education in science and engineering offering a wide range of technical degrees. Since it opened enrolment to students from outside Russia in 1991, Bauman Moscow State Technical University has increased its international enrolment to up to two hundred. The Moscow Conservatory, founded in 1866, is a prominent music school in Russia, whose graduates have included Sergey Rachmaninoff, Alexander Scriabin, Aram Khachaturian, Mstislav Rostropovich, and Alfred Schnittke. The Gerasimov All-Russian State Institute of Cinematography, abbreviated as VGIK, is the world's oldest educational institution in Cinematography, founded by Vladimir Gardin in 1919. Sergei Eisenstein, Vsevolod Pudovkin, and Aleksey Batalov were among its most distinguished professors and Mikhail Vartanov, Sergei Parajanov, Andrey Tarkovsky, Nikita Mikhalkov, Eldar Ryazanov, Aleksandr Sokurov, Yuriy Norshteyn, Aleksandr Petrov, Vasily Shukshin, Konrad Wolf among its graduates. Moscow State Institute of International Relations, founded in 1944, remains Russia's best known school of international relations and diplomacy, with six different schools focused on international relations. Approximately 4500 students make up the university's student body and over 700,000 Russian and foreign-language books, of which 20,000 are considered rare, can be found in the library of the Moscow State Institute of International Relations. Among other prominent institutions are the Moscow Institute of Physics and Technology, also known as Phystech, Moscow Aviation Institute and the Moscow Engineering Physics Institute. Moscow Institute of Physics and Technology has taught numerous Nobel Prize winners, including Pyotr Kapitsa, Nikolay Semyonov, Lev Landau and Alexandr Prokhorov, while the Moscow Engineering Physics Institute is known for its research in nuclear physics. Other institutions, such as the Financial Academy, the State University of Management, the Plekhanov Academy of Economics and the Higher School of Economics offer degrees in management and economic theory. Several Moscow institutions have divisions in other regions and countries around the world, including Russian neighbor Mongolia. Although Moscow has a number of famous Soviet-era higher educational institutions, most of which are more oriented towards engineering or the fundamental science, in recent years Moscow has seen a significant growth in the number of commercial and private institutions that offer classes in business and management. Many state institutions have expanded their scope and increased their student enrollments. Institutions in Moscow, as well as the rest of post-Soviet Russia, have begun to offer new international certificates and postgraduate degrees, including the Master of Business Administration. Student exchange programs with different (especially, European) countries also have become widespread in Moscow's universities, while many schools within the Russian capital also offer seminars, lectures, and courses for corporate employees and businessmen. Moscow is known as one of the most important centers for science in Russia. The headquarters of the Russian Academy of Sciences, as well as numerous research and applied science institutions, are located in Moscow. The Kurchatov Institute, Russia's leading research and development institution in the field of nuclear energy, where the first nuclear reactor in Europe was built, Landau Institute for Theoretical Physics, Institute for Theoretical and Experimental Physics, Kapitza Institute for Physical Problems and Steklov Institute of Mathematics are all situated in Moscow. There are 452 libraries in the city, including 168 for children. The Russian State Library, founded in 1862 is the national library of Russia. The Russian State Library is home to over 275 kilometers of shelves and 42 million items, including over 17 million books and serial volumes, 13 million journals, 350,000 music scores and sound records, and 150,000 maps, making it the largest library in Russia and one of the largest in the world. Items in 247 different languages comprise approximately 29 percent of the collection. The State Public Historical Library, founded in 1863, is the largest library specializing in Russian history. Its collection contains four million items in 112 languages (including 47 languages of the former USSR), mostly on Russian and world history, heraldry, numismatics, and the history of science. There are five primary commercial airports serving Moscow: Sheremetyevo International Airport, Domodedovo International Airport, Bykovo Airport, Ostafievo International Airport and Vnukovo International Airport. Sheremetyevo International Airport is the most common entry point for foreign passengers, handling 60 percent of all international flights. Domodedovo International Airport is the leading airport in Russia in terms of passenger traffic, and is the primary gateway to long-haul domestic and CIS destinations, and its international traffic rivals Sheremetyevo's. The three other airports particularly offer flights within Russia and to and from states of the former Soviet Union. Moscow's airports vary in distances from MKAD beltway: Bykovo is the farthest, at 35 kilometers (21 mi); Domodedovo is next at 22 kilometers (13.7 mi); Vnukovo is 11 kilometers (6.8 mi); Sheremetyevo is 10 kilometers (6.25 mi); and Ostafievo, the nearest, is about 8 kilometers (5 mi) from MKAD. There are also several smaller airports near Moscow, such as Airport Myachkovo, intended for private aircraft, helicopters and charters. Moscow employs several train stations to serve the city. All of Moscow's nine rail terminals (or vokzals) - Belorussky Rail Terminal, Kazanskiy Rail Terminal, Kievskiy Rail Terminal, Kurskiy Rail Terminal, Leningradskiy Rail Terminal, Paveletskiy Rail Terminal, Rizhskiy Rail Terminal, Savyolovskiy Rail Terminal, and Yaroslavlskiy Rail Terminal - are located close to the city center, but they each handle trains from different parts of Europe and Asia. There are also many smaller railway stations in Moscow. As trains are relatively cheap, they are the mode of travel preferred by Russians, especially when departing to Saint Petersburg, Russia's second-largest city. Moscow is also the western terminus of the Trans-Siberian Railway, which traverses nearly 9,300 kilometers (5,779 mi) of territory to Vladivostok. Moscow also has two passenger terminals, (South River Terminal and North River Terminal or Rechnoy vokzal), on the river and regular ship routes and cruises along Moskva and Oka rivers, which are used mostly for entertainment. North River Terminal, built in 1937 is also the main hub for long-range river routes. There are also three freight ports serving Moscow. Besides this Moscow has a bus terminal for long-range and intercity passenger buses (Central Bus Terminal) with daily overturn of about 25 thousand passengers serving about 40 percent of long-range bus routes in Moscow. Local transport includes the Moscow Metro, a metro system famous for its art, murals, mosaics, and ornate chandeliers. The system had just one line when it first opened in 1935, but contains 12 lines today, mostly underground, with a total of 172 stations. Park Pobedy ("Victory Park"), completed in 2003, is the deepest metro station in the world, and contains the longest escalators in Europe. The Moscow Metro is one of world's busiest metro systems, serving more than seven million passengers daily. There is also a monorail line, operated by the same company. Facing serious transportation problems, Moscow has plans to expand the Moscow Metro. Metro stations outside the city center are far apart in comparison to other cities, up to four kilometers (2.5 mi), and an extensive bus network radiates from each station to the surrounding residential zones. Suburbs and satellite cities also connected by commuter elektrichka (electric rail network). The buses are very frequent, often more than one a minute. Every large street in the city is served by at least one bus route. There are also extensive tram and trolleybus networks. In recent years, explosive growth in the number of cars has caused traffic jams and the lack of parking space to become major problems. Over over 2.6 million automobiles are driven in the city on a daily basis. The MKAD, along with the Third Transport Ring and the future Fourth Transport Ring, is one of only three freeways that run within Moscow city limits. However, as one can easily observe from a map of Moscow area, there are several other roadway systems that form concentric circles around the city. A significant portion of Russia's financial development is concentrated in Moscow, as many multi-national corporations have branches and offices in the city. The plush offices and the lifestyles of corporate employees in Moscow are almost indistinguishable from those of any Western European city, although the average salary for the Muscovite is lower. Since the Russian financial crisis in late 1998, various business sectors in Moscow have experienced an exponential rates of growth. Many new business centers and office buildings have been built in recent years, but Moscow still experiences shortages in office space. As a result, many former industrial and research facilities are being renovated into offices. The Cherkizovskiy marketplace, controlled by the Azeri diaspora is the largest marketplace in Europe with daily turnover of about thirty million dollars and about ten thousand sellers from different countries (including the China, Turkey, Azerbaijan and India). It is administratively divided into twelve parts and covers a wide sector of the city. In 2006, Forbes ranked Moscow second highest in number of billionaires, surpassed only by New York City. In 2004, Russia's thirty-six billionaires (of whom only three did not live in Moscow) held the equivalent of twenty-four percent of Russia's gross domestic product. The nouveau riche, also called the "New Russians," often pejoratively, have a reputation for flaunting their wealth; the avenues for doing so, have also increased in recent times and a sense of fashion and self-consciousness has instilled itself through the many haute couture and haute cuisine spots in Moscow. While the overall stability of Moscow has improved in the recent years, crime and corruption continue to remain a problem hindering business development. The Mil Moscow Helicopter Plant is one of the leading producers of military and civil helicopters in the world. Automobile plants ZiL and AZLK, as well as the Voitovich Rail Vehicle plant, are situated in Moscow and Metrowagonmash metro waggon plant is located just outside the city limits. The Poljot Moscow watch factory produces reliable military, professional and sport watches well known in Russia and abroad. The Kristall distillery is the oldest distillery in Russia producing various types of vodka, including "Stolichnaya" while a wide assortment of wines are produced at several Moscow wine plants, including Moscow Interrepublican Vinery. The Moscow Jewelry Factory and the Jewellerprom are important producers of jewelry in Russia; Jewellerprom used to produce the famous and exclusive Order of Victory, awarded to those aiding the Soviet Union's Red Army during World War II. There are also many other industries located just outside the city of Moscow, as well as many microelectronic industries in Zelenograd. Moscow also hosts the headquarters of various worldwide software development companies. Despite the economic growth experienced in Moscow since the beginning of the twenty-first century, many industries have undergone various crises in recent years. Some of them have been sold to foreign investors, such as OTIS and British American Tobacco, and others have been closed down to make way for new buildings, constructed as business centers. Additionally, some industry is now being transferred out of Moscow for ecological reasons. Nevertheless, the city of Moscow remains one of Russia's major industrial centers. During Soviet times apartments were lent to people by the government according to the square meters-per-person norm (some groups, including people's artists, heroes and prominent scientists had bonuses according to their honors). Private ownership of apartments was limited until 1990s, when people were permitted to secure property rights to the places they inhabited. Since the Soviet era, estate owners have had to pay the service charge for their residences, a fixed amount based on persons per living area. Due to the current economic situation, the price of real estate in Moscow continues to rise. Today, one could expect to pay $4000 in average per square meter (11 sq ft) in the outskirts of the city or $6000-$7000 per square meter in a prestigious district. The price sometimes may exceed $40000 per square meter in a flat. Many cannot move out of their apartments, especially if a family lives in a two-room apartment originally granted by the state during the Soviet era. Some city residents have attempted to cope with the cost of living by renting out their apartments while staying in dachas (country house) outside the city. In 2007, Moscow ranked top on the List of most expensive cities for second year in a row. As of 2006, there were 8.47 million Muscovites able to work. Of these, 1.73 million are employed by the state, 4.42 million are employed by private companies, and 1.99 million are employed by small businesses. There are 74,400 officially registered unemployed of working age, of which 34,400 are eligible for unemployment benefits. Moscow International Business Center or Moscow-City is a projected part of central Moscow. Geographically situated in Presnensky District, located at the Third Ring, the Moscow-City area is currently under intense development. The project, conceived by the Moscow government in 1992, is intended to create a zone within the city that will combine business activity, living space and entertainment. The whole project takes up 1 square kilometer (247 acres) on the Krasnopresnenskaya embankment. The Federation Tower, scheduled for completion in 2008, will become the tallest building in Europe. Moscow is the headquarters of nearly all Russian nationwide television network, radio stations, newspapers and magazines. English-language media include The Moscow Times and Moscow News which are, respectively, the largest and oldest English-language weekly newspapers in all of Russia. The eXile is a newspaper intended for English-speaking expatriates in Moscow and is known for its satirical nature and pranks on Russian politicians. Expert, Kommersant, and Gazeta are Russian-language media headquartered in Moscow. Expert and Kommersant are among the country's leading and oldest Russian-language business newspapers. Other notable media of Moscow include the Echo of Moscow, the first Soviet and Russian private news radio and information agency, and NTV, one of the first privately owned Russian television stations. ↑ Timothy Heleniak, June 2002, Russia's Demographic Decline Continues. Population Reference Bureau. Retrieved March 12, 2009. ↑ 9.0 9.1 Melnikov Institute. Retrieved March 12, 2009. ↑ See also: The Official Site of the Tretyakov Gallery Retrieved on 2006-07-08. ↑ See also: The official site of Borodino Panorama museum. Retrieved September 20, 2007. ↑ See also: The Official Site of the Moscow International Performance Arts Center. Retrieved on 2006-08-09. ↑ See also: (Russian) The Official Site of the Moscow Nikulun Circus. Retrieved on 2006-07-17. ↑ See also: The Official Site of the Museum of Cinema. Retrieved on 2006-07-22. ↑ 20.0 20.1 20.2 20.3 (Russian) Green dress of Moscow. Retrieved September 20, 2007. ↑ (Russian) Neskuchniy Garden. Retrieved September 20, 2007. ↑ (Russian) The Official Site of the Main Moscow Botanical Garden. Retrieved on 2006-07-18. 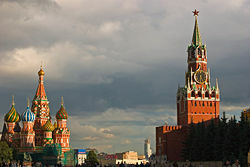 ↑ UNESCO considers the Moscow Kremlin and Red Square to be part of a single World Heritage Site. See also UNESCO's profile on this site. Retrieved September 20, 2007. ↑ BBC Sport: The mood in Moscow. BBC. Retrieved September 20, 2007. ↑ See also: (Russian) The Official Site of the Central Moscow Hippodrome. Retrieved September 20, 2007. ↑ See also: The Official Site of the Moscow Conservatory. Retrieved on 2006-07-17. ↑ See also: The official homepage of the Russian State Library. Retrieved September 20, 2007. ↑ "Average monthly salaries hit all-time high in Russia", Pravda, 2005-08-04. Retrieved 2006-07-07. ↑ (Russian) Aleksandrov, Yuri, "Новые лимитчики", New Times, 2005-12-11. Retrieved 2006-07-07. ↑ Number of billionaires surges. CNNMoney (2006-03-09). Retrieved 2006-07-07. ↑ Klebnikov, Paul, "Russia's Richest People: The Golden Hundred", Forbes, 2004-07-22. Retrieved 2006-07-07. ↑ See also: The Official Site of the Moscow Cristall distillery. Retrieved on 2006-07-08. ↑ See also: (Russian) The Official Site of the Moscow Interrepublican Vinery. Retrieved on 2006-07-07. ↑ See also: (Russian) The Official Site of the Moscow Jewelry Factory. Retrieved on 2006-07-07. ↑ http://rus.intermark.ru/about-us/press/mt_20_10/ $4,000 for a Square Meter of Apartment Space. The Moscow Times. Retrieved September 20, 2007. ↑ (Russian) The absolute record of realty cost is broken. Retrieved September 20, 2007. ↑ Humphries, Conor, "Dividing the Spoils of the Boom", The Moscow Times, 2006-06-20. Retrieved 2006-07-14. ↑ (Russian) Costs of realty in Moscow (2006). Retrieved September 20, 2007. Berton, Kathleen. Moscow: An Architectural History. New York: St. Martin's Press, 1978. ISBN 0312548885. Brooke, Caroline. Moscow: A Cultural History. New York: Oxford University Press, 2006. ISBN 9780195309515. Bushnell, John. Moscow Graffiti: Language and Subculture. Unwin Hyman, 1990. ISBN 0044451687. Dutkina, Galina. Moscow Days: Life and Hard Times in the New Russia, Trans. New York: Kodansha International, 1996. ISBN 1568360665. Girard, Marcel. Splendours of Moscow and Its Surroundings, trans. from French. London: Thames & Hudson, 1967. Khromov, S. S. History of Moscow: An Outline, trans. from Russian. Moscow: Progress Publishers, 1981. Neubert, Karel. Portrait of Moscow. London: P. Hamlyn, 1965. Schmidt, Albert J. The Architecture and Planning of Classical Moscow: A Cultural History. Philadelphia: American Philosophical Society, 1989. ISBN 0871691817. Committee for Tourism of Moscow City Government. Historical weather records for Moscow. The Moscow Times - official site of Moscow's leading English-language newspaper. Some images from Ukraina Hotel. This page was last modified on 23 October 2018, at 23:35.